As you ought to know by now (because we have run a number of articles on it), the first-ever Indie Author Day is scheduled for Saturday, October 8th. The event is designed to open the doors of local libraries to indie authors. Allie McKinney with BiblioLabs, the event organizers, has agreed to take a seat in the comfy chair and give us answers to all the questions we’re dying to ask. For starters, Allie, how are you defining “indie author”? Allie: When we say “indie author,” we mean it in a very inclusive way. Indie Author Day is meant to celebrate indie authors from all across the industry including self-published authors, those published by small indie presses and those who walk the delicate line of hybrid publishing. It’s often difficult for indie authors to get their books into libraries, and even more difficult still to get their books found by patrons once they are in it. On Indie Author Day, these authors will have the opportunity to be featured in local libraries across the U.S. and Canada and to start building up a fan base from within their communities. Lynne: What will Indie Author Day participants be expected to do? Allie: Authors will be participating in a variety of ways for Indie Author Day since each library’s event will be different. Some ways that authors will be featured include giving presentations, hosting workshops, speaking on panels, giving book readings and signing books. Most libraries are still in the planning process for their events and would be open to suggestions from authors who might have a particular way they can contribute in mind. Authors are also more than welcome to simply go to the nearest library that is hosting an event and support their fellow authors. This is an opportunity to learn, network and get inspired, no matter where you are in your writing career! Lynne: What about authors who don’t have anything published yet? Can they still help? Allie: Of course! Libraries can always use volunteers at events to help get the word out through social media, planning assistance and hands-on help for the event. If you aren’t yet ready to speak and consult with other writers, there is still plenty to be gained from this event. This is a great opportunity to speak with people who have published and to learn about the publishing paths that they chose. The event is for each local indie community as well as the greater global indie community, so your presence at this event is important! Lynne: If my library is already on the list of participants, what do I do? Who do I contact? Allie: We are currently working on encouraging participating libraries to set up their websites with information on their events and who is coordinating their events, and then we will be collecting the links to those pages to link out to from the Participating Libraries page. Until then, authors who are interested in participating in their local events can fill out the author inquiry form and let us know that their library is participating, and that they are interested in getting involved. We will then make sure the libraries are informed of any local authors who have reached out about their event. Lynne: If my library is not yet on the list, how do I add them? Allie: You can fill out the author inquiry form on the Indie Author Day website and let us know that you are interested in participating but that your library is not yet signed up. We will then assign an Indie Author Day team member to help you to get in touch with the right person at your library. We will also reach out to the library to offer any assistance we can in helping them get started. Lynne: What if I contacted my library on my own? Can IAD help me get them on board? Allie: If you’ve already contacted your library, you can fill out the author inquiry form to let us know that you have done so and to give us updates on where you are in the process of getting your library on board. Once we get your inquiry, we will assess your progress and help you get your library set up to participate. Lynne: Is there a badge I can put on my website to support IAD? What about a participant badge? Allie: Since this is the first year we are doing this, we are thrilled at how many great suggestions we’ve gotten from authors and libraries alike. We have just created badges in response to your request, so authors who are interested in promoting their participation in Indie Author Day can download digital collaterals and badges here. We have compiled the Indie Author Day logo, a participant badge, postcards, web banners digital posters that both authors and libraries can use to let other people know about the event. Lynne: I hear there will be a “digital” conference at 2pm Eastern time on the day of the event. Who will be speaking then? Allie: We have an excellent lineup of leaders across the indie book world to speak on the Indie Author Day digital panel. The panel will be moderated by Jon Fine who spent many years as the director of author & publisher relations at Amazon. The panelists include Kiera Parrott of Library Journal / SELF-e, Robin Cutler of IngramSpark, the BCALA Ebook Literary Award winner L. Penelope, and the director of the Louisville Free Public Library, Jim Blanton. You can learn more about all that these individuals are doing to support indie publishing in our blog post. Lynne: What are you doing for readers that day? Allie: Readers are encouraged to come out to celebrate their favorite indie authors and to discover other fantastic local writers. In addition to presentations that are geared toward other authors, there will also be readings, book signings and author talks in most participating libraries. Then, readers can enjoy the books by their local authors that are available in these libraries through programs like SELF-e, IngramSpark and more year round. 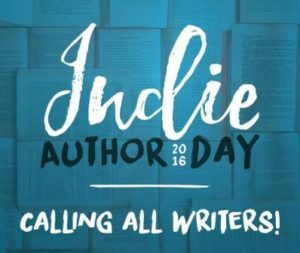 Book lovers of all kinds will learn something new and have a wonderful literary time at Indie Author Day! Lynne: I can’t wait! Thanks for taking the time to talk with us, Allie, and here’s hoping for big success! Thanks, Lynne and Allie! I will be putting a badge on my blog and website later today! Thanks for helping to get the word out, Melissa! Great question! Anyone who is unable to attend the event will be able to view the digital panel presentation at 2 p.m. EST since we will be live streaming it on YouTube. We will circulate links to the YouTube location for the panel closer to the time of the event. Also, authors can follow all of the action on the day of the event on Twitter by watching the hashtag #AuthorDay16.